This Handbook is an introductory guide to community development and capacity building. It is designed primarily for those who have an interest in community development but who may not have an in-depth understanding of the concept, the process or the resources available across Canada. 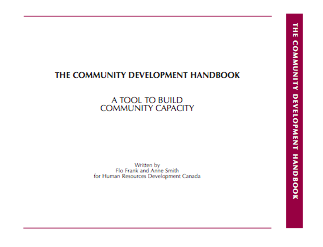 For those who already have knowledge and/or experience of community development, the Handbook offers a resource for reviewing the basics of the process and exploring or initiating community development. The guide includes definitions of basic terms, explanations of community development as a process and the most common challenges (and solutions) attached to community development.